This book is a good introduction to understanding the parts, structure, and meanings of the Tipiṭaka. Tipiṭaka is the Pāli word meaning "Three Baskets" used to describe the body of discourses and teachings (in three categories) credited to Siddhartha Gotama, or the historical Buddha. It is also called the Pāli Canon. Specialized monks memorized his stories and discourses for centuries before coming together to put them into one body of work. A descriptive overview is given for each section, or "basket" of the Tipiṭaka, including the Vinaya Piṭaka (code of disciplinary rules for monks and nuns), Abhidhamma Piṭaka (collection of philosophical treatises), and the Sutta Piṭaka (Buddha's discourses). 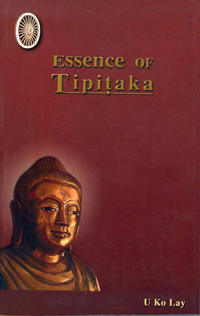 The author of this concise guide to the Tipiṭaka is U Ko Lay, formerly the Vice-Chancellor of Mandalay University and a devoted student of Sayagyi U Ba Khin. I've started reading more Dhamma books and have found that the references to various quotes from the Tipitaka are confusing. This little book helps me to sort that out. Useful now and as I explore this wonderful literature more over time. such a great little volume, really helps put the suttas in perspective for a relative novice like me. If you're like me then you may also have felt uncertain how to approach the multi-volume work known as the Tipiṭaka. With all those divisions and subdivisions of subdivisions, where to start? Not to render myself completely overwhelmed and ignorant, I at least knew the Tipiṭaka is divided into three main parts: vinaya (rules for monks and nuns), suttanta (discourses) and abhidhamma (detailed analysis). I wanted to go deeper though and learn where specific sections and passages are located that I've been exposed to at vipassana courses. Where is the Mahāsatipaṭṭhana Sutta located? How about the stories of Kisā Gotamī and Paṭācārā or the Jātaka tales? Where exactly does the Buddha expound on past Buddhas, the moral precepts, the wheel of dependent origination or even on the basic three we hear about again and again: sīla, samādhi and paññā? Enter Essence of Tipiṭaka. I found this book helped answer many questions in a very approachable, clear and concise way yet with still enough detail to rouse my curiosity and enthusiasm about reading the actual Tipiṭaka. I can honestly say I feel less overwhelmed about what's where and that many of the anecdotes and theories I've been listening to and practicing in my meditation are closer at hand. After reading Essence of Tipiṭaka, I really look forward to going back and re-reading parts of the Tipiṭaka that have been translated in English by Bhikkhu Bodhi and others. I highly recommended this book if you're interested in a clear and easy-to-follow guided tour of the Tipiṭaka.